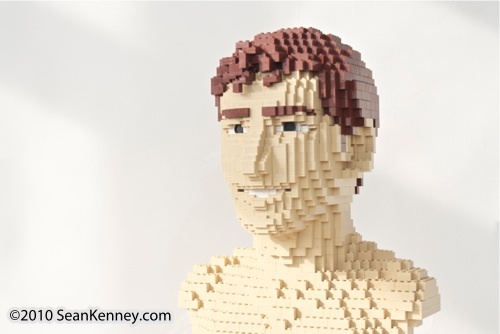 Imagine opening a box and seeing a LEGO sculpture of yourself! 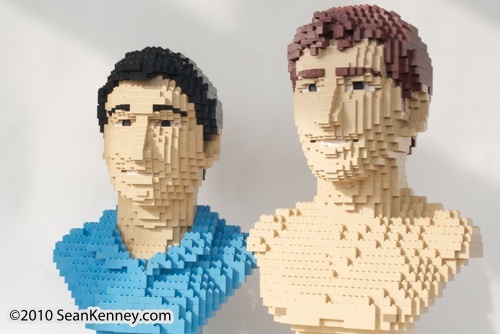 This life-size bust sculpture of LEGO-maniac Burk (and his brother Zach) was commissioned by their mother and given to him as a Christmas present. It was a great honor to have created something so special for these boys. 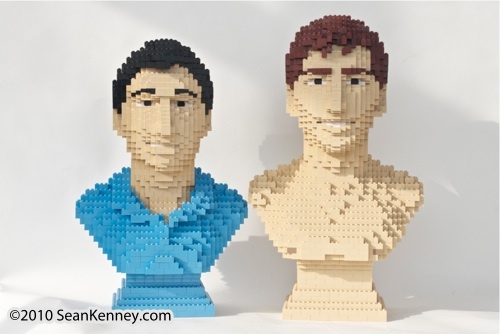 The sculpture is about 20 inches tall and contains about 2,500 LEGO pieces. 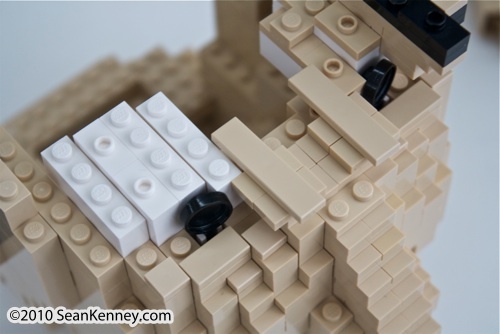 Creating curved shapes with LEGO bricks is quite challenging. Creating human faces is even more challenging. And creating the face of someone you've never met is definitely the toughest challenge any artist can face! 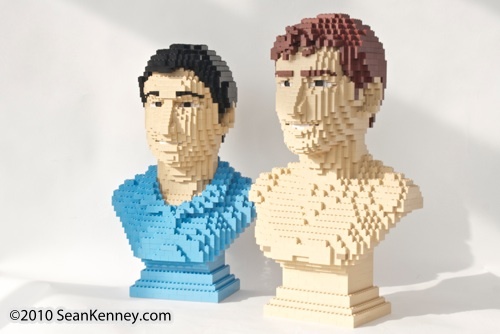 It was also a great experience and a lot of fun, because I was given the luxury of spending my entire summer working on these two busts (unlike lots of other projects when I must rush like crazy to complete them). 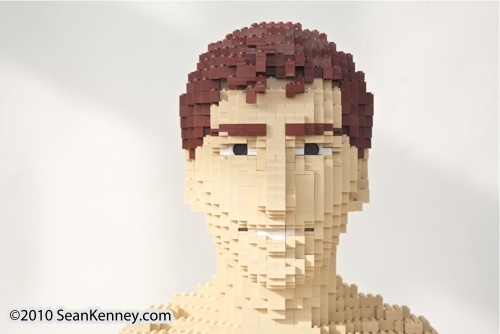 Creating human faces with LEGO bricks is always very challenging. I began by getting lots of photos of Burk ... side views, front views, and anything I could get ahold of. 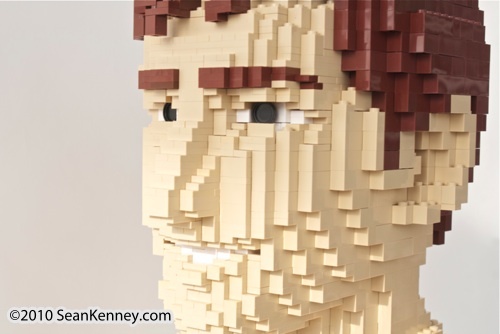 I drew his face onto specially-designed graph paper that has a grid designed to the same proportions of LEGO bricks. 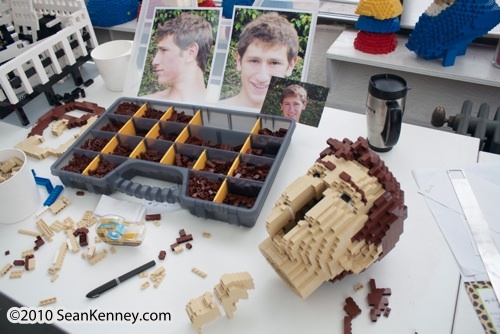 Then, using the drawings as a guide and looking at all the photos, I built a test face. Then another, and another, each time making little changes until after lots and lots of test models and prototypes, the sculpture eventually started to take shape. 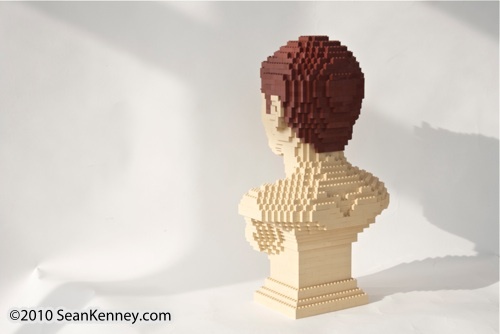 It takes lots of time and patience! The eyes are always the hardest part. Here's a sneak-peek into how I built them... (they are mini-fig frying pans!) Eyes are always really hard, because if they are even the tiniest bit off they look completely ridiculous. I mounted them with clips, turned them a bit, and slid them down behind a lower eyelid made from a 1x2 panel (The photo below is an older design without the panels). 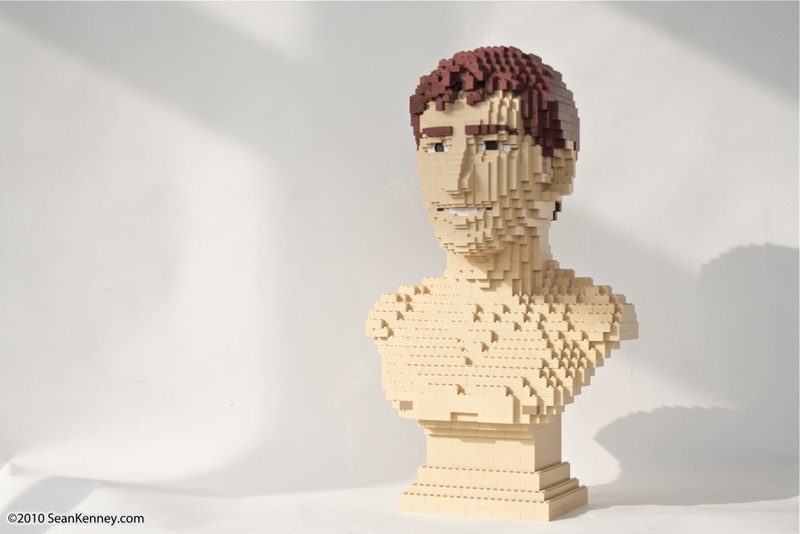 Then the jumper plates around his eyes are offset in two directions, creating corners that are only a quarter-of-a-plate using a fair bit of fancy LEGO voodoo.